Hope Island Veterinary Surgery welcomes you to our website! Dr Helen Greenhalgh opened the surgery in 1998 next door to our current address. In 2003 she started construction on a purpose built practice. This new practice has been built with the health of your pet and your peace of mind as its number one priority. There are 3 spacious consultation rooms with state-of-the-art equipment for us to thoroughly examine your pet. In the waiting room we have a variety of diets; food for normal healthy pets and also diets for those with special needs. Our nurses are highly trained and can advise you on the best diet plan for yourpet. We also stock a large range of accessories: anything from collars and leads to bedding, dental requirements, grooming tools and yummy treats. Our hospital is very spacious. We have large kennels for our bigger dogs, cages for the little ones, a separate ward for our feline friends. Our cages have heated floors for those recovering from surgery or illness. All our patients receive comfortable bedding, regular toilet walks and the very best of care from our staff. We have a separate sterile surgical theatre fully equipped to do routine surgeries such as desexings and lump removals, but also orthopaedic and specialist surgeries such as fracture repairs, cruciate ligament repairs and even eye surgery. We also have treatment benches in the hospital for non sterile procedures such as dental scaling and polishing, dental extractions, ear flushing etc. We are also able to do Dental X-rays for an in-depth look at your pets teeth. For dental procedures we have a state-of-the-art dental machine that cleans and polishes your pet?s teeth to remove plaque and tartar and freshen your pet?s breath. We also use a dental Xray machine to aid diagnosis of oral cavity disease. We use human grade anaesthetics and thoroughly researched drugs; and we endeavour to make your pet?s experience in our hospital as stress-free and safe as possible. All patients are monitored closely by an experienced nurse throughout their stay. In a separate dedicated area we have modern x-ray facilities to assist us in making correct diagnoses. Our clinic has the latest laboratory equipment to run tests on your pet. Routine blood screens, heartworm tests, urine tests and electrolyte testing can all be performed in-house rather than sending samples away. Further extensive testing is done by an external pathology service delivering prompt results. Our vets and nurses are up to date with the latest information and regularly attend conferences and courses to expand their knowledge. 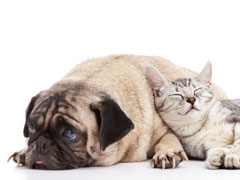 If we feel your pet needs specialist care we will be happy to refer them. Our experienced dog groomers service, on a Monday, Tuesday and Thursday, Pamper your pooch with a warm hydro bath, blow dry and even a haircut. We only use the best Shampoos and Treatments; medicated shampoo is available on request. Thank you for taking the time to read about our veterinary practice and the services we offer. We welcome your comments and suggestions. Please contact us at (075)530-1105 for all your pet health care needs.